90% & 40% US Silver Coins. 2018 1/4 oz Australian Gold Kangaroo Perth Mint Coin. 9999 Fine BU In Cap. 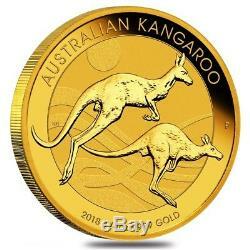 Bullion Exchanges is delighted 2018 1/4 oz Australian Gold Kangaroo Perth Mint Coin. First minted in 1986, they featured gold nugget designs until 1990 where the Kangaroo, the Australian national symbol, replaced the reverse design. The coins are minted in a limited quantity every year which increases its demand on the market. They come in different sizes of 1 kg, 1 oz, ½ oz, ¼ oz, and 1/10 oz. The coin's design features the most recognizable wildlife symbol of Australia - Kangaroo. 9999 fine gold with a weight of 1/4 oz. Struck by the Perth Mint. Limited mintage - 150,000 coins. Individual coins come in acrylic capsules. Obverse: Displays a popular profile portrait of Queen Elizabeth II by Ian Rank-Broadley. 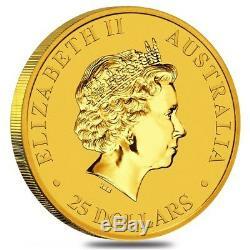 The device is surrounded by the inscriptions "25 Dollars, " "Elizabeth II, " Australia. Reverse: Features two kangaroos bounding across a stylised rural landscape. Bullion Exchanges offers you a great selection of exclusive items from renowned international refineries. Add this splendid 2018 1/4 oz Australian Gold Kangaroo Perth Mint Coin to your collection today, and it will be carefully wrapped, packaged, and delivered to your address. By purchasing from Bullion Exchanges, you are agreeing to all of our Terms and Policies. Bullion Exchanges reserves the right to refuse or cancel any order reviewed by our Compliance Team, which are deemed questionable or have increasing potential risk for being fraudulent. All customers are subject to a review at our own discretion, in which additional information, identification and/or documentation, may be requested. A prompt response would help expedite the fulfillment of your order. Packages are no longer insured if the tracking information shows the package is delivered. We will only be liable to cover packages that are lost in transit or damaged. There are no exceptions to this policy. Once an order is placed, it cannot be modified or cancelled. Using high definition digital video, we record the packing of our products to affirm accuracy. Bullion Exchanges reserves the right to refuse or cancel any order reviewed by our Compliance Team, which are deemed questionable or have potential risk for being fraudulent. The submission of an order and subsequent receipt of a confirmation locks in your order and affects our metal hedging requirements and thus we are unable to make any price adjustments. Our in-house numismatist staff assign conditions to all products. The condition assigned to the products is derived from industry-wide standards. We do not offer or make price adjustments based on the market fluctuations of precious metals, or for any other reason. We will never ask the customer to pay more for a product if the price significantly increased, so please refrain from requesting price adjustments after market prices decrease. The item "2018 1/4 oz Australian Gold Kangaroo Perth Mint Coin. 9999 Fine BU In Cap" is in sale since Friday, November 10, 2017. This item is in the category "Coins & Paper Money\Bullion\Gold\Coins".exchanges" and is located in New York, New York. This item can be shipped to United States.